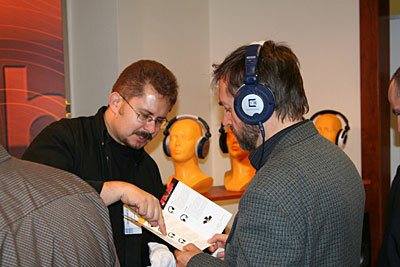 It is time to summarize this years' Audio Show. The number of exhibitors in the Sobieski hotel hit the record. For the first time we used 6 stories of the hotel AND all 12 conference rooms. Until now we used the floors but without the conference rooms or all the rooms and not all the floors. The exhibitors used 21 conference rooms and 38 hotel rooms all together. This is the maximum that the Bristol and Sobieski hotels can offer. It is possible, that next year we will have to resort to the three hotels formula. This is even more probable as there were interested companies this years, which had no space available at the AS! Those of you that were there saw it with its own eyes - practically the corridors and rooms were full both days of the show. To pack-up more people than the number that was in the hotels from 11:00 till about 14:00 is probably physically not possible! The first time in the history of the cue at the Sobieski hotel entrance, counting 20-30 people, was uninterruptedly present until 14:00 hours. Including VIP's over 7000 people visited the show, about 20% more than last years. Also the daily entrance record of the Sobieski hotel was broken - on Saturday over 4000 people visited this hotel. We are still below the record figure from 2001, but then we had 3 hotels and lasted for 3 days - we had 9 "hotel-days" then (3days x 3 hotels) and only 4 of those "hotel-days" this year (2 hotels x 2 days). But we are moving in the right direction. The reportage in HFN should appear shortly in one of the coming issues. The show surprise. Planned for about 40-50 people presentation of HDTV and the Plasma vs LCD workshop gathered 100-150 each time, and about the same amount of people was not allowed in due to lack of space. Blu-Ray Disc presentations on a 65" Plasma TV and FullHD projector in the Panasonic room - every time the room was full. This shows how interested the visitors were with display technologies and how big the "hunger" is for it among them - or broader, among the consumers..
As a whole the show was very satisfactory, what allows to look into the future and to Audio Show 2007 with optimism. The date of the new show will be set shortly. As always, the main report from the Audio Show will be in "Audio" and will mainly touch - at least in the written part - the "human factor" on the show, meaning observations related to the visitors. Here and now I would like to focus on the sound and award (completely arbitrarily) distinction for sonic value, and not only that.. I have already mentioned this before, but let's repeat: overall the sound in the Sobieski hotel was worse than last year. Hotel reality always requires compromise, but this year they were larger than before. Maybe this was related to the fact that the amount of expositors and rooms increased, and due to this the always present good systems were thinned? I don't know, and actually I would like to be wrong, but after two days of the rabbit chase I was not really satisfied. This is the reason that the systems, that could be described as "high fidelity" - high quality (reality) - should be specially honored. On the top floor, room 702, after last years absence AkustyK returned, one of the major players in the Polish speaker DIY scene, privately the editor in chief of the "Audio". And maybe he is privately a sound technician (=akustyk in Polish)? It doesn't matter - what matters is the fact that he has a passion and love for what he does - because "without love you will only be a resounding gong or a clanging cymbal" if I may rephrase the known citation. This characteristic is in Audio in general, and in DIY especially, most important. And the return of AkustyK was special, because with one of the best, at least for me, project R1v3. 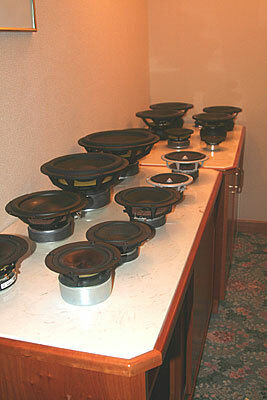 This are speakers based on Scan-Speak Revelator drivers, chosen by a key. A switchable cross-over was prepared for them - due to the special abilities of the used drivers the DIY-man may construct a 1-st order cross-over, or a higher order one, just based on his temper, vision or owned components. This is the ultimate step to reconcile the followers of both options. Or maybe I am naive? Maybe, but in the end it is mostly not about sound here, but about the idea. And I stop to be an audiophile where the sound stops and ideology begins. I listened to both types of filtering (the speaker test in the December issue of "HIGH Fidelity OnLine"), I listened for long, and I must say one thing: here and now, in this project a higher order cross-over sounded better. Yes, we had a little more freedom in the mids with the first order, a kind of energy, that did not translate into precision and amount of information, but just blurred the space. Personally I don't care how something is built, important is what I get from it, and how it translates to sound. If in a construction the advantages of a first order cross-over dominate over the disadvantages - I go into it, if not - I turn away. Anyway - the fun is great and everybody should listen to this design, change the elements (it just takes a minute) and have lots of fun. You can even leave the material value of the 'eroneversionthree' aside, however, if we consider, that for 4500 zł you can buy a complete, mounted speaker box with speakers that are used in hi-end from the 15000 - 20000 zł range, the case becomes bright. The Audio Show 2006 DIY saga does not end here. In the, presenting its offerings every year, company Akkus I heard one of the best sounds of the show, presented by the speaker kits C95-R1 (the price for screwed together pair - 8500 zł). I heard them before, but they did not make a big impression on me, so maybe something changed in them since that time, sometimes even little modifications convert a speakers into a piece of art. And in this case every modification is even more difficult due to the used speakers, difficult to have them applied properly - ribbon tweeter from Raven and the ceramic mid-woofer from Accuton. The sound was full, but also detailed, filled, vivid, it was really a joy to listen. Beautiful was the palette of timbres - from the almost black and white elements, contoured and contrasted to half-shades and halftones giving together dense, complete sound. Also here many discussions, talking and exchange of vision could be heard. But most of all lots of music. . .
Immanently related to DIY is the urge to reduce costs, to make something as good as possible for the lowest amount of money possible. This is the reason that many enthusiasts pick-up the soldering iron (or hammer - depending on what they are trying to achieve). And, I think, that this is no coincidence, that the presentations that impressed me most were the ones with cheap speakers involved. 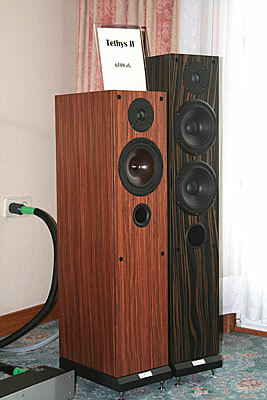 Let's start with probably the cheapest, from the Krakow company Harpia Acoustic and the model 2395, a name that includes the price to pay for the speakers. For this money, we get floor standing, brilliant sounding little speakers. On the exposition they played paired with NAD devices from lower shelf, however their sound was incredibly energetic, saturated and full, and with all this just plain pleasing. It is incredible, that for so little money one can put together a system, that impresses more than many fat hi-end ensembles. 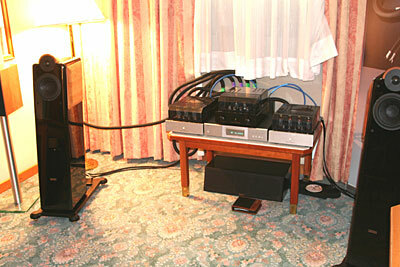 Not that the latter would be worse - comparing the 2395 with the huge model Doberman showed the gap between them and the quality of the new, high range of Harpia, however the price difference was also quite large - the Doberman were powered by the powerful Audio Research mono power amps and dCS-a P8i player. Let's go up in the price. To get there we will have to go in the horizontal direction, to the Bristol hotel. There, as always, in the Kossak room, the company ESA installed its exhibition, this time sharing the room with Intrada electronics - Cyrus and Nagra. Two systems and two reasons to be satisfied. For almost 5000 zł one can buy the new ESA construction, the Intrada 3. It sounded wonderful, really beautiful. Attributes similar to the sound of the 2395 Harpia speakers, and to this some saturation of the mids and a shadow of warmth. I am sure, that partially for this success and the Sound of the Show award, the Cyrus electronics is responsible, placed on the companies stand, but without a proper speaker it would not do anything. An here I have a problem, as I have to switch to the standing just behind them (or better said "over" them) next ESA speakers, but this way we would jump not two or three steps up, but a few stories. We will be back. With the speed of light we transfer to another distinction, that I give to the Totem Hawk speakers with Simaudio electronics. With clean conscience. I don't know how they do it, but every time I heard them the Totem speakers sound great. Maybe it has something to do with the fact, that this are good speakers? Maybe, but this year one of the reasons was the tasteful electronics. 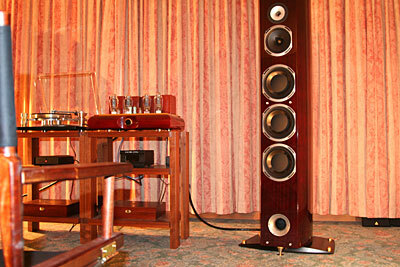 The Canadian Simaudio proposes devices, which construction would do no shame to the biggest purist and designer. And in addition the incredibly big, readable displays! Why others don't make them like this - I really don't understand that, it is so easy. It is common knowledge, that the age median of the audiophiles grows and most of them were unable to see the minute, barely visible digits on displays the size of a hand watch, even in their best years. Anyway, Simaudio has the displays nice looking and functional. The next event is the official distribution (not only the "quasi distribution" in suitcases) the US magnetostatic Magnepan speakers. This is one of the most unusual designs, which, in the right conditions and with the right electronics, can sound better than classic speakers costing three or four times as much. On the other hand, in inconvenient space-electronics surrounding, they can give way to despair... Interestingly, although we mostly associate them with the quite costly constructions MG3.6 or MG20, Magnepan portfolio starts really low. On the show the model 1.6 played, costing 9990 zł and it was beautiful. 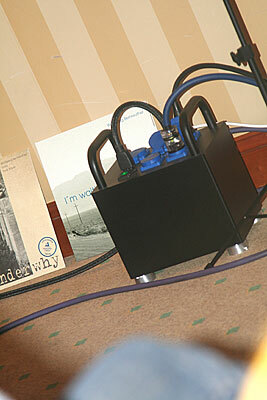 Driven by Simaudio electronics it sounded incredibly precise and had a surprisingly strong bass. While their space - it is mostly about the size of the stage - was heavily limited by the room (these are dipoles in the end), the precision in creating the events was really noteworthy. 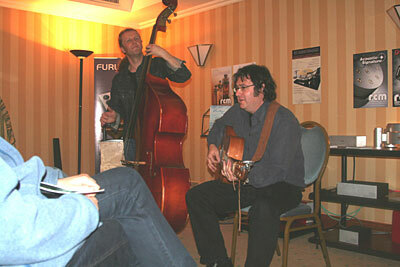 And finally the Event of the Show, for which we have to go back to the Bristol hotel. 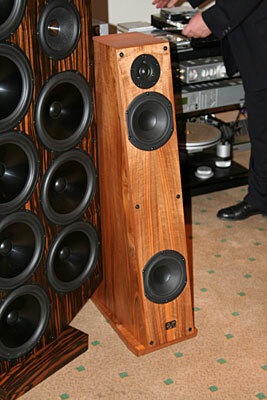 Monumental, beautifully crafted, surprising, incredible speakers Revolution No.9 from the company ESA (I told you, that we will return to it). Speakers, manufactured in the form of dipoles, with nine beautiful Scan-Speak drivers, from the noble line Revelator with a combined surface of 3000 cm2, 18-cm midrange speaker Scan-Speak with a carbon fiber cone and the tweeter Revelator R29. The construction is as uncommon, as without compromise and innovative, that its description covered three pages in small font. And, frankly speaking, the descriptions of the ESA speakers are the cream on the pie - never and nowhere (maybe beside Wilson Audio speakers) I have seen such well written introduction to construction of speakers, with a technical description, that can teach something to a complete layman. And the sound of these beasts is amazing - "no limits" dynamics, that can be achieved only on huge open air concerts, outstanding tonal balance, and micro detailedness similar to one achieved in small, tasteful miniature speakers. Interestingly, in spite of the many speakers and the uncommon construction the sound was not overwhelming, and did not dominate the room. I just think, that the speakers were placed too close to the listeners. And it is not about the need to be away from the speakers to have the sound integrate, because as it comes from the design the integration happens very close to the panels, but it is about the intensity of the experience offered by the Revolution. They project a real, large stage and instruments of real size and sound volume. This was surely helped by the Nagra electronics - including the Polish premiere of the PMA Pyramid mono power amplifiers - but I know Nagra from other configurations and did not hear something like that. Back to the experiences: the intensity of the sound transfer is high, and to not to allow to turn it into chaos and unreadable information noise we have to stand back a little. Sitting just by the back wall made it better than in the second row. So we transferred permanently to the Bristol hotel. 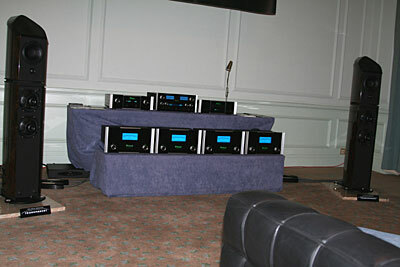 Just behind the wall of the Kossak room, in the Curie room, the presentation of the newest CD player from the company Ancient Audio took place. The Lektor Prime, another Event of the Show. In this device something incredible was achieved - its sound is in most aspects as good, if not better, than in the top, three part Lektor Grand. And we gaet that for half of the price of the latter. Such things happen very rarely, but this is also a sign, that being true to oneself and ability paired with hard work, pay back with real advance. In this case it is visible in the lower price for the - now- top model, and a headache, thinking of a new flagship, which will not feel the breath of the Prime in its neck. Bristol was very generous this year, and wherever I went (almost), something magic was happening. So, two rooms further, in the Reymont room, occupied by the Katowice based company RCM an event took place that combined Event of the Show with the Sound of the Show - the live performance of the duo Wolfgang Bernreuther&Rudi Bayer. Anybody that wasn't there should pity. 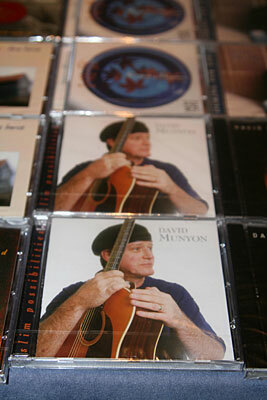 Fantastic atmosphere, nice songs, charming musicians, and live sound of highest quality. I think that for many people it was a surprise, that a contrabass, such a large instrument, is so silent, and that its sound does not resemble splitting stones in a quarry, but is quite warm and rounded, and has no to the point directional characteristic - it can be heard from a quite large space. It should be remembered, when we will criticize speakers for a not enough dense bass and the lack of precision in pinpointing the contrabass place in space... The performance was accompanied by a successful show of the amplifier Bonasus of the company RCM, the same I used for the presentation Bits, Hertz, pits in the Sobieski. Manufactured like a dream, completely in Poland, it shows, that our countries hi-end has much to tell, and finally reached the level of World Top Class not only with the sound, but also with the workmanship quality. So we come to the last award for the Sound, the system composed of the Wilson Audio Watt/Puppy 8 speakers (Polish premiere), Audio Research Reference series electronics (also a premiere) and EMM Labs player, the test of which was revealed by "Audio" during the show. I was not convinced at first to this presentation. First it sounded incredibly transparent and proper, but the "soul" was missing. After some time it started to get better, and the third time it was OK. 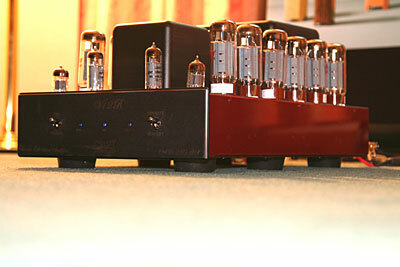 I think, that the powerful amplifiers AR 210 just then got warm enough to reach nominal parameters. In any cast the sound was incredibly precise and thorough. 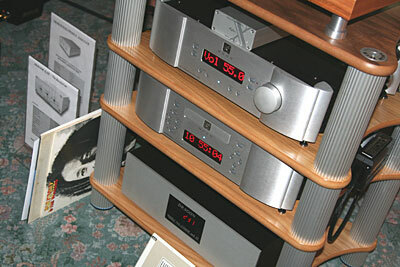 Some people complained, that it lacked warmth, like the one that could be found in the Accuphase room. I tend to disagree with that opinion. I don't like lucidification, I get toothache from them, but I also dislike coloration, and those, in the system presented by the distributor company FAST, were not present. The brass was sheer brilliant in their opening and speed. 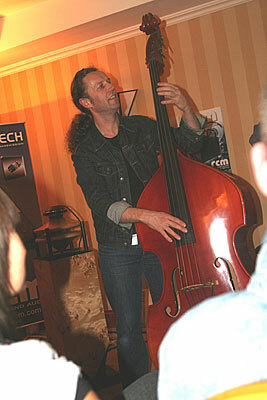 Bass was incredibly well controlled and powerful. Like a fairytale. 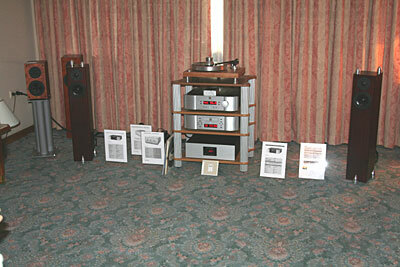 The recordings were played from the Nottingham Analog gramophone and SACD player (mainly SACD disks) from EMM Labs. 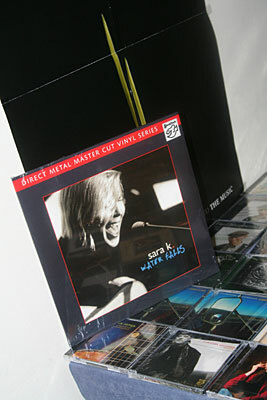 And don't be insulted - I mean vinyl lovers - SACD sounded much better. But - EMM Labs is an absolutely top player, the measurement standard of this format, a player, which level in unmatched by any other competitor. Only dCS offers a different set of features, but even it must succumb to EMM Labs in the culture and maturity of the sound. And, for the very end, let's mention the absolute premiere of the Ultrasone Edition 9 headphones- exclusively mature sound, that can really be appreciated at home, after thorough listening to it. 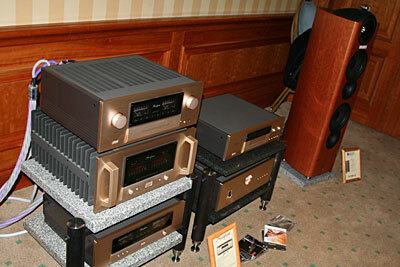 It was all right, really all right, and in many ways the climate of the High-End show from the hotel Kempinsky era, the Mecca of audiophile Europe, was brought to Warsaw. 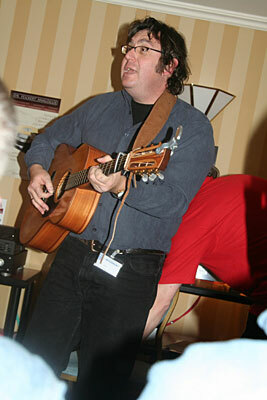 The enthusiasm of many expositors met the enthusiasm and goodwill of the visitors, what created a new quality. It did not happen without glitches, but I even don't want to remember them, they are not worth it. I prefer to remember the positive things. And there were a lot of them. TV as large as a wall? Ah, maybe a small wall? 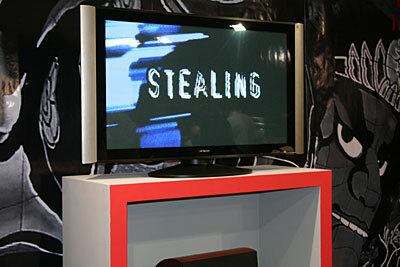 Of course - Hitachi prepared a plasma TV with 141 cm diagonal. "This model will be optimal for you" - this is the way the distributor of the relatively young, German headphone company, Ultrasone, recommended their products. 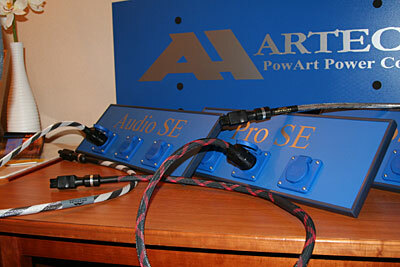 The distributor of Ultrasone offers also A.D.A.M. 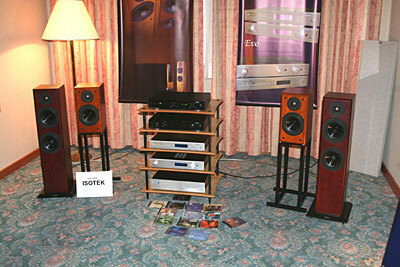 speakers, on this photo the active models are visible - a sound engineer's dream. 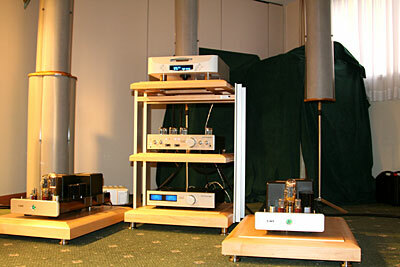 Just to water our mouths: at last the top models came to Poland, touching upon the legend of the company the preamplifier S.C.-7S2, mono blocks M-9S2 and the SACD SA-7S2 player. 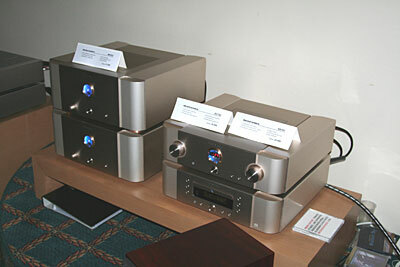 These units will only stay in Poland for a short while, but the distributor, Audio Klan, promised to import them permanently. 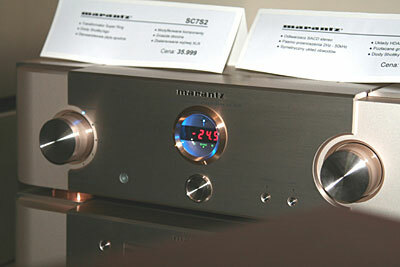 The top devices from Marantz enchant with round windows with lit meters. The finish - perfect. Next gem - B&W Bowers&Wilkins 801D speakers with Classe electronics: CDP-100 player, preamp CA-2100 and the powerful CA-M400 mono power amplifiers. The system composed of Xindaka and Paradigm played loud and dynamic. Too loud for me, but if it was about showing the power and bass - this was done perfectly. Something that was very efficient (probably the idea was taken from the Berlin expo): air moisturizer with a scent. Entering the Acuphase room the visitors felt easy and safe - maybe also due to this "contraption". 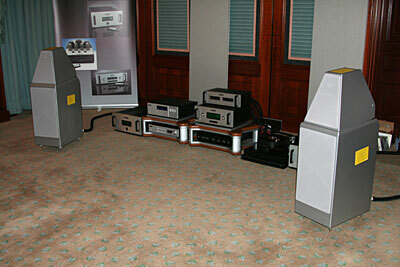 One of the best presentations (for me) on the Audio Show - one of the Sounds of the Show: Wilson Audio Watt/Puppy 8 speakers (Polish premiere), Audio Research electronics - preamplifier Reference 3, power amplifiers Reference 210 paired with the beautiful sounding SACD player of the company EMM Labs. 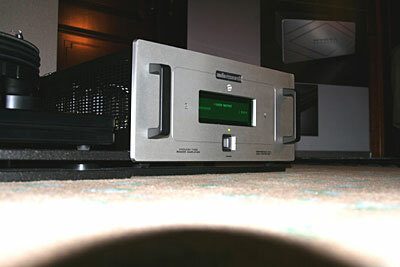 Power amplifiers (mono blocks) Reference 210 have large, readable displays in their fronts, where for example the output power can be displayed. 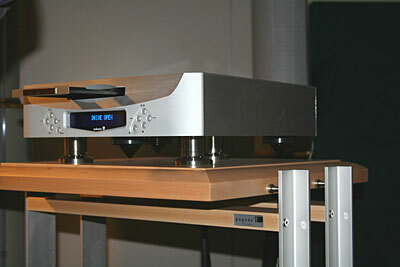 Accompanying the Reference 3 Audio Research preamp was the phono stage PH5 of the same company - a part of the presentation was based on SACD disks, and a part on vinyl. 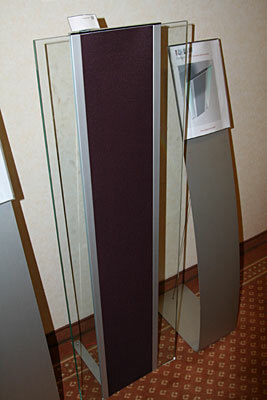 ESA had something to be proud of this year: the biggest impression made the monumental, precisely made dipole speakers Revolution No.9 , the 9 standing for the number of bass drivers. I never heard such dynamics - maybe on a live performance. Add to this the precision of the mids and treble - and you have something extraordinary. Revolution No.9 are dipole speakers, but "directed dipole", with controlled propagation of the energy radiated to the back. The cross-over is placed in a separate module, what diminished the influence of the enclosure's vibrations on the elements, especially on the coils. 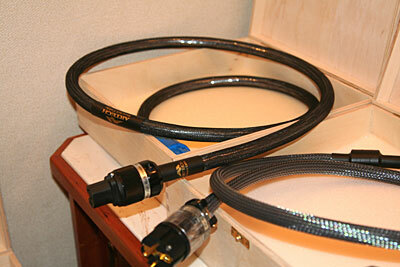 In spite of the high efficacy (93 dB (2,83 V/1 m by 6 Ohm) Revolution require solid electronics. 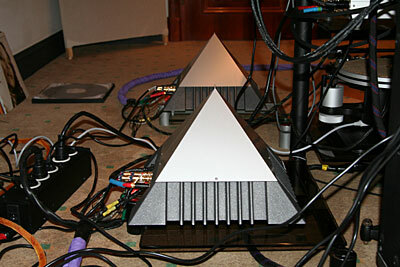 In this case those were the Nagra PMA Pyramid mono blocks - a premiere in Poland, connected to the PL-P preamp and DAC of the same company. 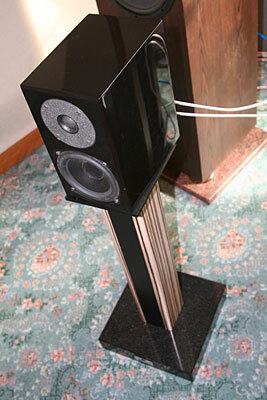 You have to pay 81 000 zł for the Revolution, but for 5000 zł you can have, maybe even more surprisingly, the Intrada 3 speakers. 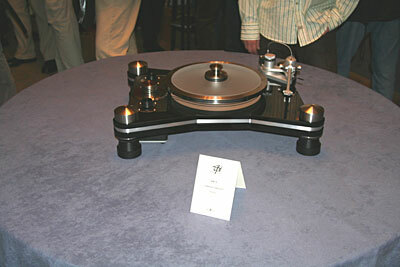 A further stir in the hi-end scene - Hi-Fi Club became the distributor of the superb record players from the US company VPI. 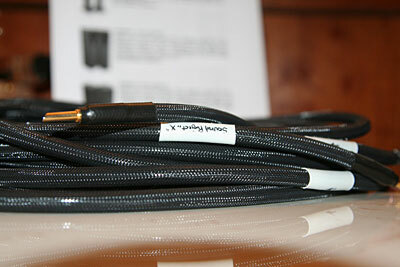 On the photo the model HR-X (39 000 zł). 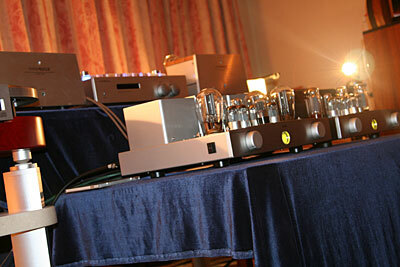 Hi-Fi Club presentation, perfect, as always. This year the big speakers Chimera from Wilson Benesch were invited, playing powered by four power amplifiers from McIntosh, the MC501 (500 W) in a bi-amping configuration, tube preamplifier C220 and the split CD player MDA 1000/MCD 1000. One of the best sounds of the show - RCM system, based on the companies own amplifier Bonasus (25 000 zł), with a tube rectifier, Acoustic Signature Analog One gramophone, with SME5 tone arm and the ingenious Dynavector XV-S pick-up, as well as the omnipolar Duevel Bella Luna speakers. Mains filter RCM Separator bringing whole 35 kg on the scale. Projected price - 4000 zł. And so we come to the absolute Top Event of the Show: the live performance of the duo Wolfgang Bernreuther on the guitar and Rudi Bayer on the contrabass prepared by the Katowice based RCM. The duo Wolfgang Bernreuther and Rudi Bayer publishes records under the Clearaudio label, so they are available on CD and LP (180 g). 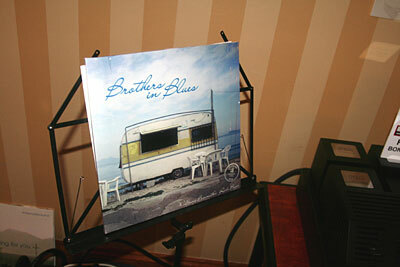 On the photo their newest album (I acquired one myself, with their signatures) Brothers In Blues. First rank Event of the Show was for me the premiere of the one-box (it is difficult to say "box" in this case, better would be said "one-platform"...) Lektor Prime player of the Krakow company Ancient Audio. 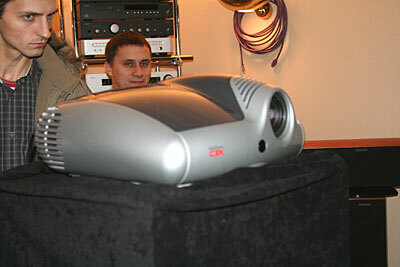 The device costing about the half of the price of the Lektor Grand (Prime's price - 32000 zł), in many aspects it tops the more expensive construction. 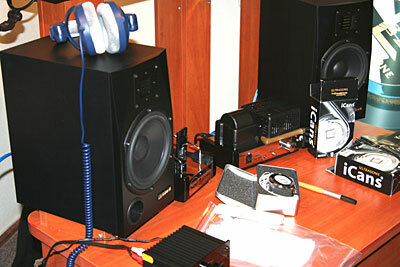 And how can I not speak about progress in the sound reproduction. 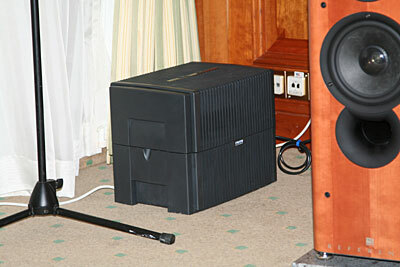 Power to the Ancient Audio system was supplied by the Wrocław company Velum, the silent partner of many successful presentations on the Audio Show. Shortly new products will be announced, they are just waiting to be christened with new names, so we will have a closer look on them shortly. A superb debut on the Audio Show had the record company Stockfisch, brought to Poland (not coming from afar, as Stockfisch is located in Germany) by the company Nautilus (actually audio shop Nautilus). 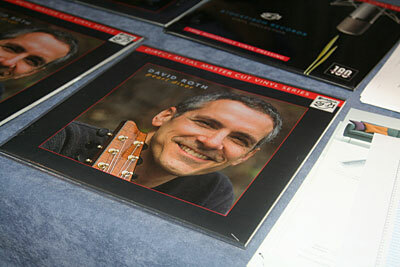 Stockfisch brings out CDs, SACDs and LPs - the latter in the process, used in late 80's by a company trying to save the vinyl, Harmonia Mundi, called Direct Metal Master. The company AkustyK, preparing speaker kits for DIY enthusiasts probably smelled profit, because it appeared again after a year of being absent at the show. As I noticed, especially this year many sensible, knowing the topic, people visited it. A sign, that the spirit of DIY is still alive. 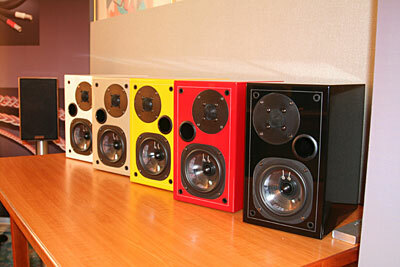 One of the hits of AkustyK are perfectly made, with care for every details, R1v3 speakers. Their specialty is the "regulated" cross-over. Their buyer gets besides the very good speakers: Scan-Speak Revelator quartet - D2905/9900 tweeter and 18W8531G mid-woofer (the whole 2500 zł), receives the set of elements to solder together the cross-over (the soldered version with cabling about 500 zł per pair), which allow to make 1st or higher order filters. 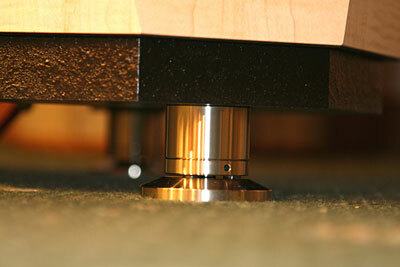 As listening shows, every method of filering has its pro's and con's. Fun is guaranteed. 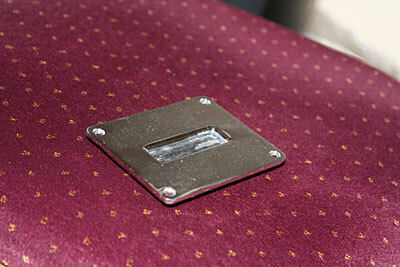 If we don't have a set of tools in our garage, we can buy redy made enclosures, with natural veneer, for 1500 zł (pair). So for 4500 we get a construction, that, if prepared by let's say Sonus Faber, would cost 15000 - 20000 zł. 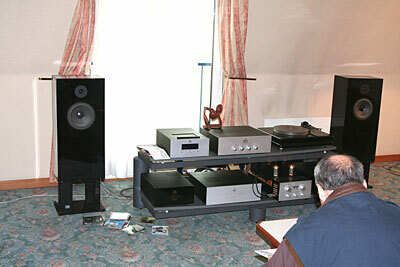 In the system a few really interesting and nice sounding devices were shown. 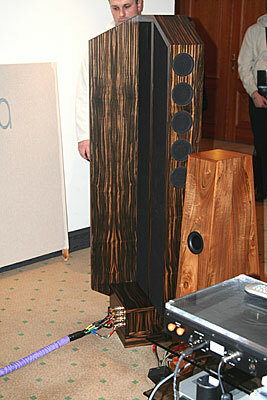 For a few hundred zloty's one can create a clone of the superb stand speakers Totem Mite, here named "Mietki". 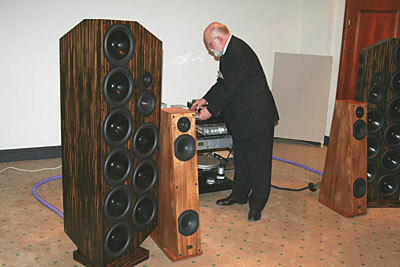 Just because the speakers used in the originals and in the clones were manufactured by the Polish Tonsil. New in the Polish market - Alubase - a furniture company. 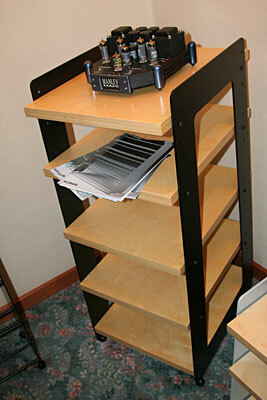 It offers CD racks and very simple, but also beautiful equipment stands. As always with great curiosity I listened to music in the Audio Academy room, with the models Hyperion IIIs (4300-4800 zł) and Tethys II (6500 zł) being displayed. 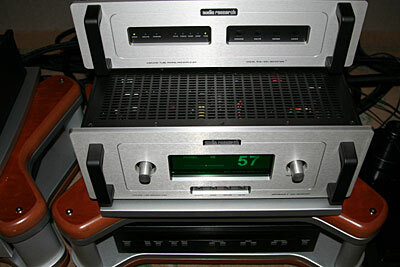 Audio Academy speakers were powered by Monrio - Asty Line preamplifier and the stereo power amplifier MP2, connected to dCS-a P8i player. 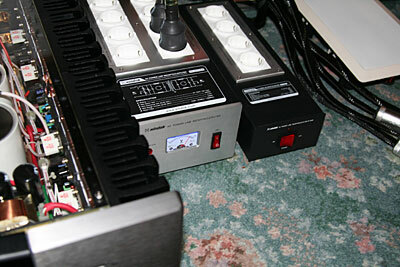 Power supply - Shunyata Research. Next Polish speaker manufacturer - RLS. Very nice, engaging sound was provided by the Charon (4500 zł) and - interchangeably - Phobos II (2600 zł, from behind on the photo) speakers. 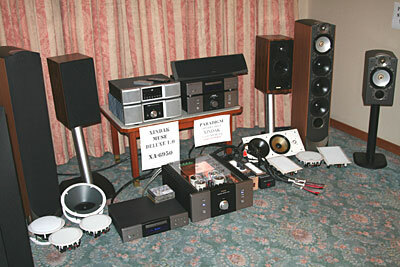 The electronics was supplied by Naim. 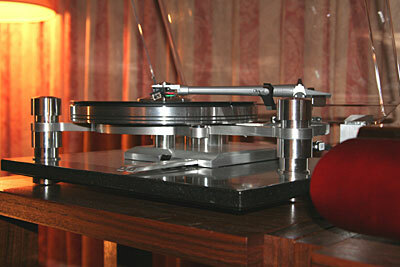 The gramophone is Reeloop MK5 (1499 zł) with Shure M97xE (366 zł) pickup and Sonneteer Sedley (3500 zł) preamplifier. Superb and cheap power cables were presented by the company Artech, including the new cable Mosquito (290 zł/1,5 m) and freshened-up Pro-Jet (600 zł/ 2 m). After a moment of being asleep the company Sound Project returns, among others with a new headphone amplifier (the previous version was quite a success) and the speaker cable Model X. Built from tinned copper (like Supra cables) with addition of silver, beefed up with BFA connectors will not be cheap 2 x 2,5 m should cost about 1000 zł. The German Ceratec is one of the manufacturers of designer loudspeakers, who does not forget about their inside while designing them. 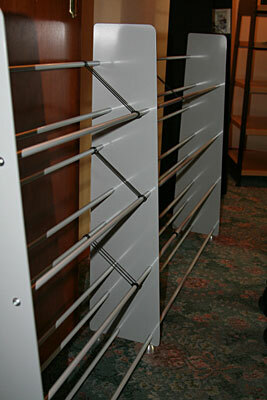 For next year nicely looking electrostatic panels are being prepared - wow! 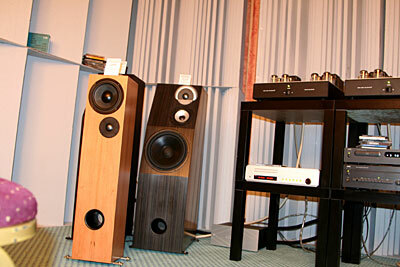 The speakers Faqt of Ceratec: we find a ribbon tweeter there. 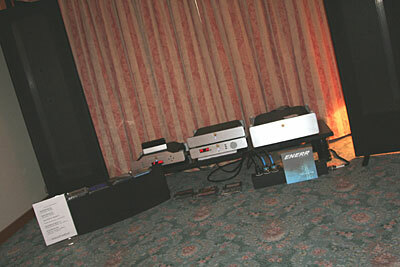 The room of Szemis Audio Konsultant was filled with devices from Audio Note. 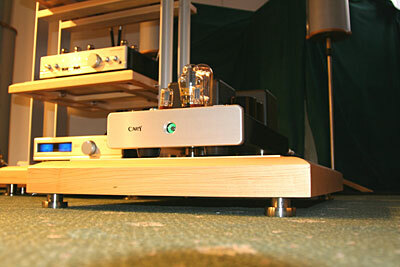 In the nicely sounding system, with extreme internal coherence and "attention" played the AN-E/SEC speakers with external cross-over AN-E/SEC EXT, amplifier Ongaku, preamp M8, DAC 5 converter and CDT Two player. Cables - of course Audio Note's silver. In this humorous way, turning the equipment front to back, the company Ansae presented its products, specialized in power cabling and mains filtering. 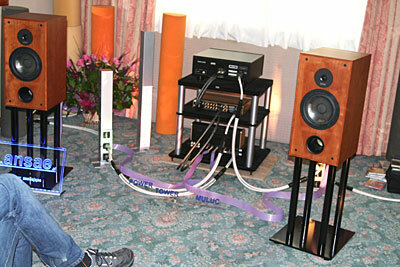 I don't know how big was the influence on the sound, as it was also shaped by the rest of the sound path Spendor speakers, Jolida amplifier and Copland CD player. The newest product of the Czech company Acoustique Quality is the powerful subwoofer equipped with the Peerless speaker, powered by a class D amplifier, and a passive cone . 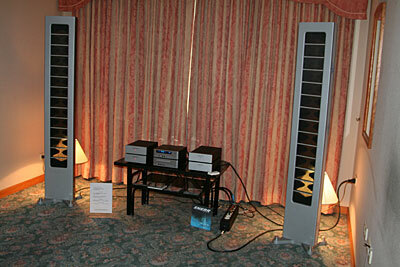 Simaudio electronics with long not seen flat panels, fantastic magnetostatic Magnepan speakers. Very different sound from the one we are accustomed to. 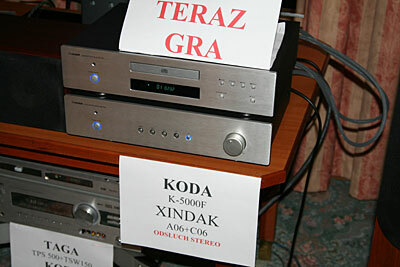 Now it is time to "un-acquaint" ourselves, because the quite cheap model (9900 zł) 1.6 sounded very interesting. 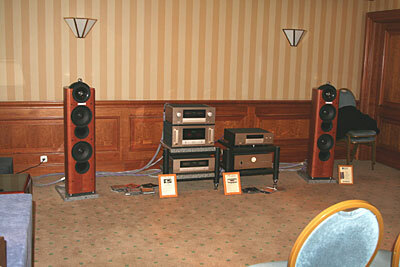 The room prepared by Audio Forte was filled with sound, that could earn the Sound of the Show award. It happens, that Totem speakers, this year the model Hawk, always sound very good in the hard conditions of the Sobieski hotel. 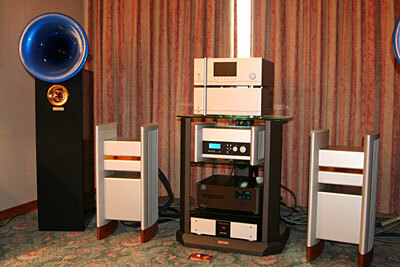 The very good sound in the Audio Forte room was probably helped by the mature electronics of the Canadian company (25 years on the market) Simaudio - Supernova player and Moon i7 amplifier. Please note the ingenious displays - large, bright and still nice looking. Cabling is another new acquisition of Audio Forte, the company MIT. Power supply - NEEL. 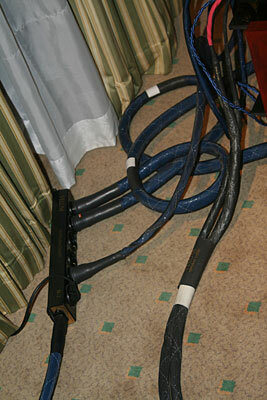 Next novelty on the Polish market - German elektrostats Audiostatic DCM 4. 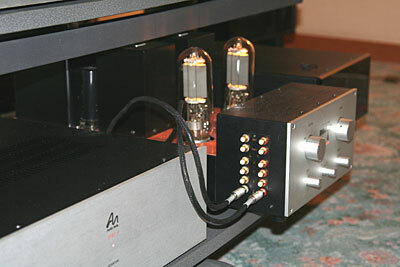 Connected to Polish power amplifiers Audiomatus (class D - the same B&O technology as used in Jeff Roland amplifiers) and the beautiful split player Resolution Audio Opus 21. Regardless of the characteristic mini-tower looks, Opus 21 is a full fledged player with built in preamplifier, costing about 15000 zł. The functions are split between the cabinets in a non typical way - one chassis houses the power supply and control circuitry, the other the drive and output stage. Just a moment ago I heard that the previous Halcro distributor, due to the latter companies push for home cinema, resigned from providing that brand, here we have a new distributor, who seemingly does not care. 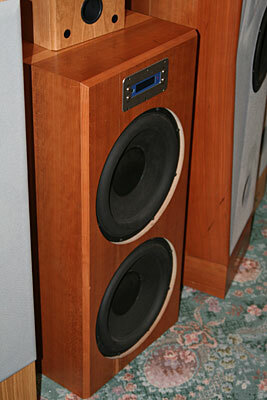 Acapella tube speakers were also part of the system.. 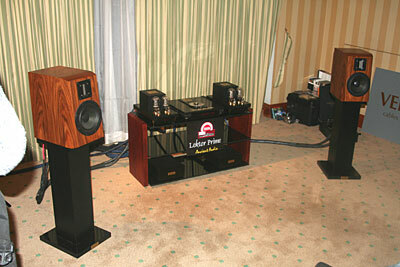 The Prima Luna and Usher distributor's room - as always the sound was top notch. 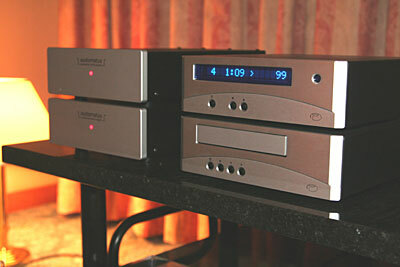 The system was based on Usher CD-1 player, Prima Luna Three preamplifier, the power amps Six and Usher CP6311 speakers. 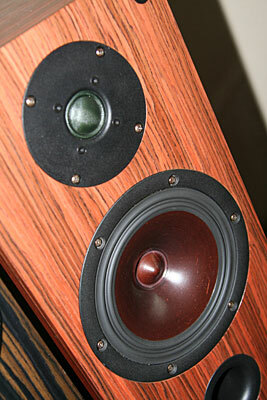 In the price of the Usher S-520 speakers (about 1200 zł) it is hard to find a similarly well done product. 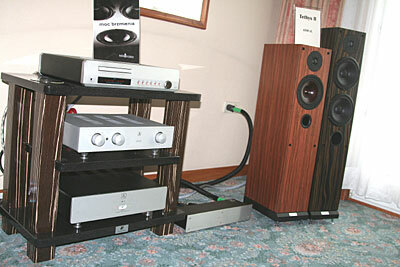 Now the sound is joined by the finish - in a broad spectrum of choices. 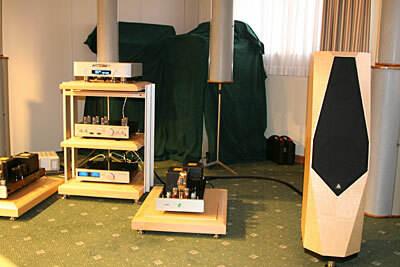 Foto Pub room filled with Chinese electronics Opera Consonance and EgoVox, amplifiers (on the photo) based on electronics designed by a Pole, Mr Marków. 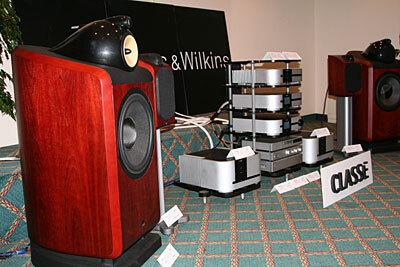 Absolutely one the leaders in terms of the Sound of the Show - C95-R1 speakers located on the Akkus shore, prepared in the form of kits. 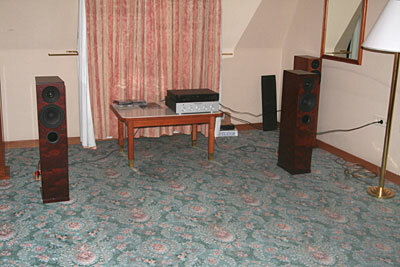 Upper range - Raven R1 ribbon speaker, mid and low range the ceramic Accuton C95-T6. For me absolutely the winner in the category Debut of the Year - US speakers Joseph Audio and the best Return of the Year, now with greater momentum - Manley electronics. Both brands easily created one of the best Sounds of the Show. The sound path was composed among others with the preamplifier with integrated D/A converter Wave and the gramophone preamplifier Stealhead. 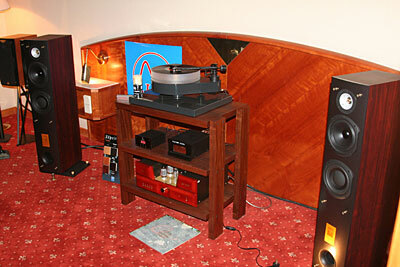 Another outstanding sound, this time in the room with Creek electronics from the Destiny series and Epos M22 speakers. Another positive surprise - Avalon Acoustic The Symbol speakers together with MBL electronics, taken recently for distribution by Audio System, in the shape of the 1531 player and 7008 amplifier. Incredibly energetic sound, thorough and juicy. 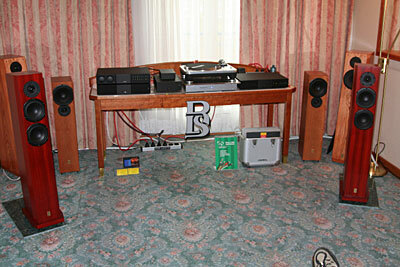 Interestingly the speakers dedicated to multichannel setups sounded very good here, in a stereo setup. 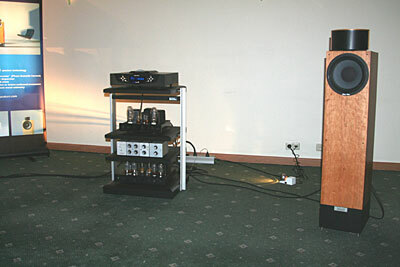 Now - Avalon and MBL sounded beautifully, but that what was happening in the room with the stand speakers WLM Diva escapes describing - the sound free from space constraints, incredibly mannered - just the Sound of the Show. 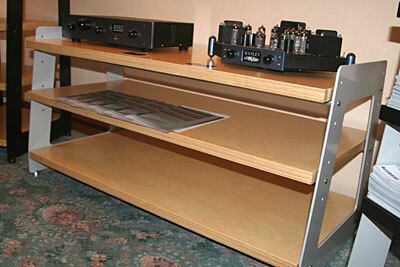 WLM Diva were powered by a superbly crafted amplifier Cary V12R, based on 12 power tubes. 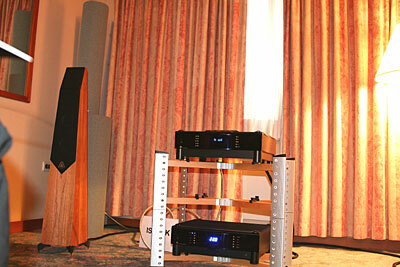 Another big debut: Triangle Magellan Concerto Sw2 speakers driven by JJ electronics. 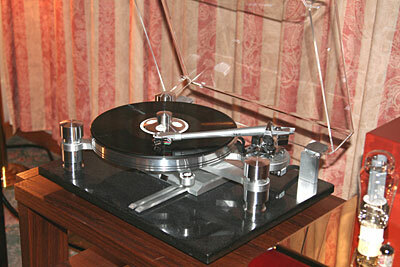 Also the gramophone Oracle Delphy Mk V was responsible for the spectacular sound of the Triangles . 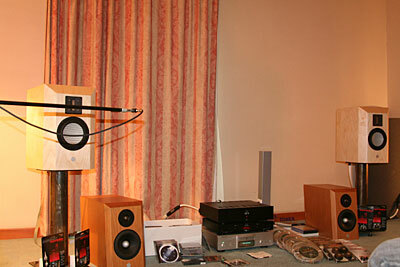 Another room with Triangle speakers, where the sound was even more impressive, probably due to the fact, that the Altea Sw speakers cost so little. 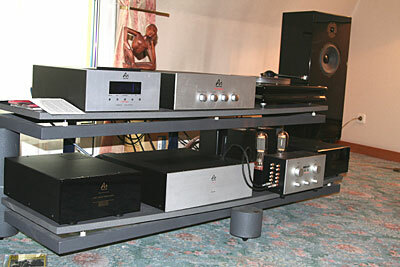 Electronics - JJ 828 amplifier, JJ 283 phono stage and Pro-Ject RPM10 gramophone with Speed Box MkII and Sumiko Blackbird pickup. 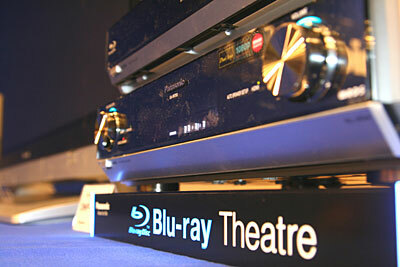 Panasonic prepared a presentation of its Blu-Ray DMP-BD10 player together with the SA-XR700 amplituner. 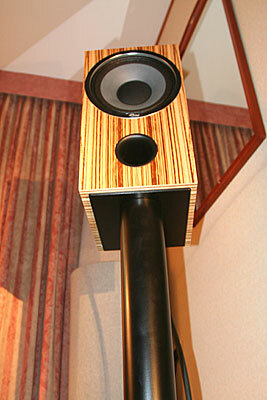 One of my dreams - Avalon, model Eidolon speakers, here in the newest version: Diamond. 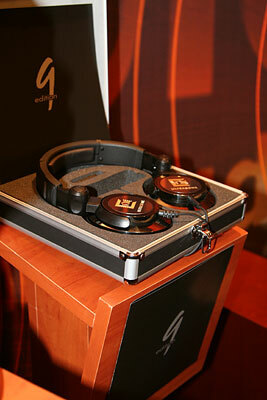 Perfectly made, sound with great potential. Avalon are very demanding speakers, so to drive them the distributor, Audio System, included all the best it had: the, based on power triodes 805, mono blocks Cary Audio CAD-805, split tube preamplifier (on 6SN7) Cary Audio SLP-05 and the CD player Audio Aero Prestige. 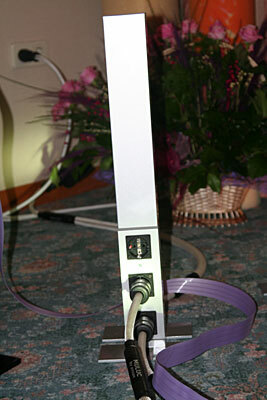 Cabling - Fadel Coherence. 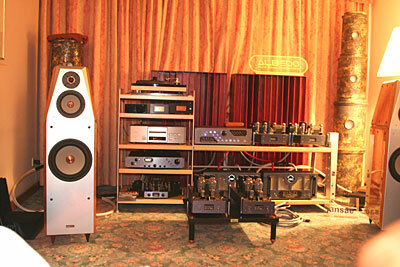 All elements of the Avalon/Cary/Audio Aero system stood on shelves/stands of the company Finite Elemente. This is a German company, whose products are in almost all systems of the main stream editors of the world. Terribly expensive. 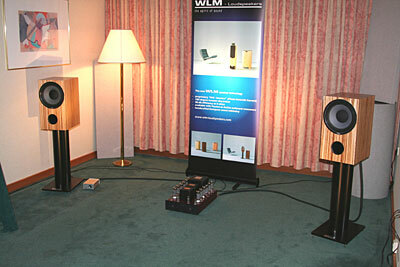 If not for the earlier heard stand WLM Divas, I would probably die from happiness listening to the speakers Grand Viola, aided by a ingeniously concealed subwoofer. It sounded much better than in the cheaper system, but the price difference was also huge. 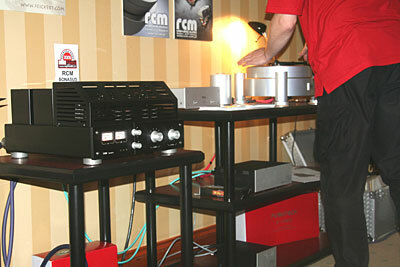 The sound source here was the Audio Aero Capitole Signature Edition player with the Cary SLI-80 amp. This is surely one of the Sounds of the Show, and due to the lowest price in the noble group, maybe also one of the major surprises: priced 2395 zł Harpia Audio speakers, with the much telling name 2395. driven by NAD electronics they showed the abilities of the designers. 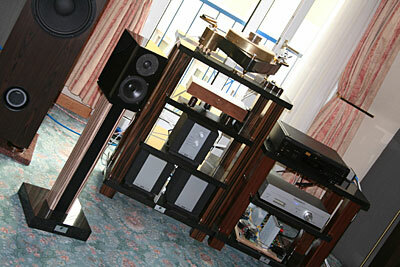 The sound was fast and juicy, dynamic and filled - just superb sound. Audio Center room - brilliant integration of the speakers KEF KHT 3005, that received this years EISA award, with Arcam electronics. 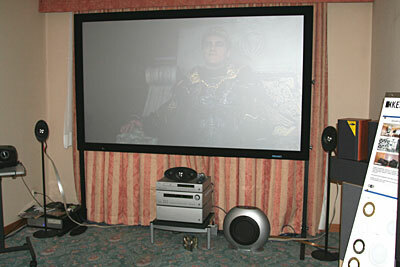 For a home cinema sound - an A+. 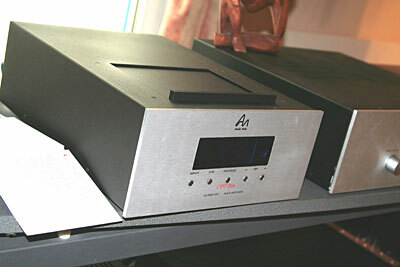 Arcam electronics for home cinema - on the photo the player DV137, AV9 processor and the P7 power amplifier - this is one of the better guarded secrets of British audio. 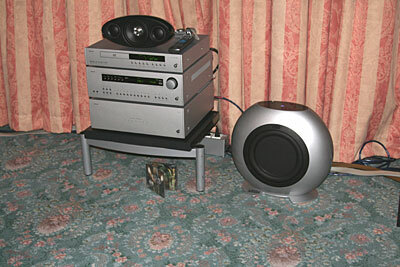 Seen for years as hi-end for little money composes well with KEF, both in terms of sound as well as design - take a look at the KEF subwoofer on the side of the devices.